Derby, July 19 (IANS) Having played four league matches at the County Ground here, India skipper Mithali Raj on Wednesday banked on the “home” advantage to tame World Champions Australia in the second semi-final here on Thursday. Despite the advantage, Mithali also warned her side to play according to the situation in the crunch game. 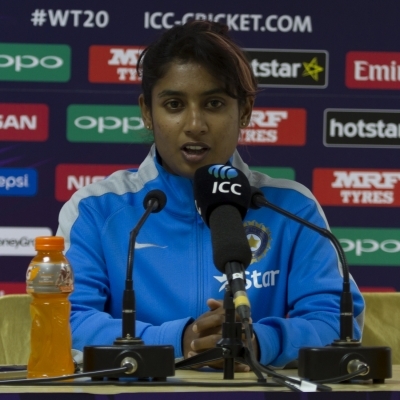 “We’ve played a lot in the group stage here, four games, so we are aware of the conditions and that is our advantage,” Mithali said in the pre-match press conference. “How the players play the situation is important because having said that Derby is our home ground, you need to perform on that day to win. “Australia is a very good side. They won the last edition of this tournament and they have a lot of players who have played in high pressure games,” the 34-year-old added. Making her final World Cup appearance, Mithali — the highest run-getter in women’s One-day Internationals (ODI) — felt it would be “exceptional” if the young Indian side can outshine the opponents. Going by statistics, India managed to win just one ODI out of four against the Southern Stars since the last edition of the World Cup in 2013, with the eight-wicket loss in the league stages of the ongoing edition being the latest. “But for this Indian team, it is going to be a big game and if we can pull out one win, it will be exceptional by the team,” she said. Meanwhile, Australia opener Nicole Bolton also cautioned her side against any sort of complacency when they face the Indians, who will be in a good frame, especially after the morale-boosting 186-run win against the New Zealanders in their final group encounter on the same ground. “India have played a couple of matches at Derby as well so they’ll be pretty familiar with the conditions as well. We can’t afford to be off our game, as you have seen throughout the tournament, if you have an off day the other team can get a big jump on you,” said Bolton, who has scored 337 runs in the tournament so far. “We’ll have to do a bit of homework, look at the conditions and see what Derby has to offer because I think India will come out and really take it to us,” she added.